Howie Choset is a Professor of Robotics at Carnegie Mellon University where he serves as the co-director of the Biorobotics Lab and as director of the Robotics Major. He received his undergraduate degrees in Computer Science and Business from the University of Pennsylvania in 1990. 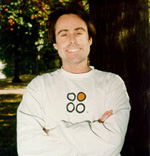 Choset received his Masters and PhD from Caltech in 1991 and 1996. Choset's research group reduces complicated high-dimensional problems found in robotics to low-dimensional simpler ones for design, analysis, and planning. Motivated by applications in confined spaces, Choset has created a comprehensive program in modular, high DOF, and multi- robot systems, which has led to basic research in mechanism design, path planning, motion planning, and estimation. This work has been supported by both industry and government; DOD support includes two MURIs, one of which Choset was the CO-PI, a young investigator award, and multi-PI awards for modular systems. Choset.s group has produced over 60 journal papers (including 2 in Science and one in Proceedings of the National Academies of Sceince), 180 conference papers and 15 patents. Choset.s work has also been recognized by several best paper awards and nominations at ICRA, IROS and other robotics meetings. Choset's research program has made contributions to challenging and strategically significant problems in diverse areas such as surgery, manufacturing, infrastructure inspection, and search and rescue. In addition to publications, this work has led to Choset, along with his students, to form several companies including Medrobotics, for surgical systems, Hebi Robotics, for modular robots, and Bito Robotics for autonomous guided vehicles. Recently, Choset.s surgical snake robot cleared the FDA and has been in use in the US and Europe since. Choset also leads multi-PI projects centered on manufacturing: (1) automating the programming of robots for auto-body painting; (2) the development of mobile manipulators for agile and flexible fixture-free manufacturing of large structures in aerospace, and (3) the creation of a data-robot ecosystem for rapid manufacturing in the commercial electronics industry. This year, Choset co-lead the formation of the Advanced Robotics for Manufacturing Institute, which is $250MM national institute advancing both technology development and education for robotics in manufacturing. Finally, Choset is a founding Editor of the journal .Science Robotics. and is currently serving on the editorial board of IJRR. In 2002 the MIT Technology Review elected Choset as one of its top 100 innovators in the world under 35. In 2014, Popular Science selected Choset's medical robotics work as the Best of What's New in Health Care. In 2005, MIT Press published a textbook, lead authored by Choset, entitled "Principles of Robot Motion." Finally, Choset's students have won best paper awards at the RIA in 1999 and ICRA in 2003; his group's work has been nominated for best papers at ICRA in 1997, IROS in 2003, 2007, and 2011, and CLAWAR in 2012; won best paper at IEEE Bio Rob in 2006, SSRR 2012 and 2015; won best video at ISMICS 2006 and ICRA 2011; and was nominated for best video in ICRA 2012. "Nothing in the world can replace persistence. Talent will not; Nothing more common than the unsuccessful man with talent. Genius will not; unrewarded genius is almost a proverb. Education will not; the world is full of educated derilicts. Persistence and Determination are omnipotent." -- Calvin Coolidge. B.S.Eng. in Computer Science, University of Pennsylvania (Moore), 1990. B.S.Econ in Entrepreneurial Management, University of Pennsylvania (Wharton), 1990. M.S. in Mechanical Engineering, Caltech, 1991. Ph.D. in Mechanical Engineering, Caltech, 1996.